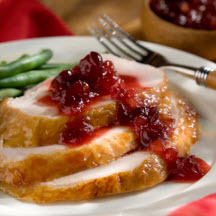 This delicious chutney, made with cranberries, maple syrup and ginger, makes an ideal accompaniment to carved turkey. Bring to boil on medium heat, stirring frequently. Reduce heat to low. Simmer, uncovered, 10 to 15 minutes or until cranberries begin to pop and mixture thickens. Allow to cool at room temperature, then refrigerate, covered, for at least 2 hours to chill and flavors to blend. Nutritional Information Per Serving (1/8 of recipe): Calories 264; Fat 0g; Cholesterol 0; Protein 0g; Saturated Fat 0g; Trans Fat 0g; Sodium 199mg; Carbohydrates 67g; Sugar 57g; Iron 0%; Fiber 0%; Calcium 0%.